Richard Sherman is great at playing cornerback and yelling at people. Tom Brady wins Super Bowls. 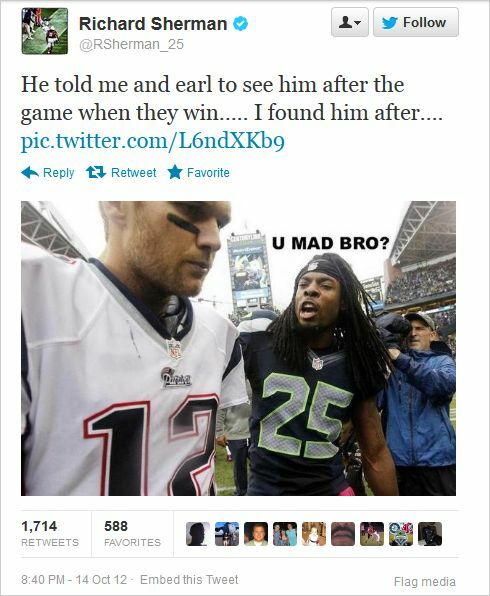 Last week, Sherman had a great game in a competitive sport where guys yell rude things at each other for several hours. He apparently picked on Tom Brady all day, and eventually picked off one of his passes. Then got all up in his business about it, looking like one of those fans who points to his hat, or holds out the logo on his shirt. I felt it was a very Twitter-in-real-life confrontation. Well, that’s just not nice. Both are “celebrities”, but Tom Brady – like him or not – is a Wheaties box, GQ cover guy while Sherman – talented in his own right – is more likely to show up in a coupon flyer for your Seattle area Safeway. This is not Muhammad Ali taunting Joe Frazier. That perspective is not to take away Sherman’s great game. For the day he was a very relevant player in Tom Brady’s life, but it is likely the two will never play each other again. Twitter gives us a direct line to people we see on TV and has fed all of us the delusion that we are relevant to celebrities. We can – right there in public – add an “@” before their name and send a message right to them! Occasionally, they even write back. The Fonz tweeted to me once and it was magical. Twitter doesn’t put us on the same social level as celebrities but essentially puts us ALL in the front row. There’s a chance we’ll interact with our heroes, and maybe bring that unsavory internet-comment behavior with us. Richard Sherman is a cornerback for the Seattle Seahawks. Tom Brady is Tom Brady. Hey, we’re ALL a little jealous of Tom Brady. He’s the face of a franchise. He’s won 3 Super Bowls to Sherman’s 0, has been NFL MVP twice and makes about 20x Sherman’s salary*. Also, he gets to play QB. He’s not sweating it. Like Twitter, a football field is a great equalizer, if only the illusion of it. 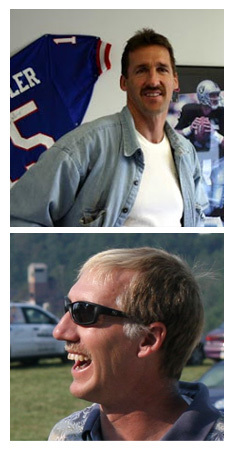 My uncle Brett played high school football against eventual New York Giants Super Bowl winner Jeff Hostetler (most Western PA guys have that same mustache) and apparently sacked him once or twice. As a 13-year-old this led me to believe he would have been BETTER than Jeff Hostetler if not for the tragic fact that my uncle did not go to college. As a 35-year-old I know that there is a difference between BEING a quarterback and TACKLING (or in Sherman’s case, intercepting) a quarterback. There are exceptions: Joe Theismann and Lawrence Taylor come to mind. In addition to position, accomplishments and money, there are several gaps between these two players: Half a generation – Sherman is 24 and Brady is 35. Sherman “Tweets” to about 21,000 followers. Brady isn’t even ON Twitter but has about 21,000 fake accounts dedicated to his name. Experience – Brady has been playing football since Sherman was in jr. high school. All players are important, but in some ways, Richard Sherman is as far from Tom Brady as Regular Joe fans are from Richard Sherman who SEEMS like your average Twitter follower. We’re all Richard Shermans. *Tom Brady had his salary restructured this year to help the Patriots stay under their salary cap. He knocked his base salary down to $950,000 but gets a $10.8 MILLION signing bonus. And who-knows-what for endorsements.